Sand Under My Feet: My Travel Bucketlist Says "We Travel Not To Escape Life, But For Life Not To Escape Us"
Of course you can still travel after you have saved so much and have retired from work. 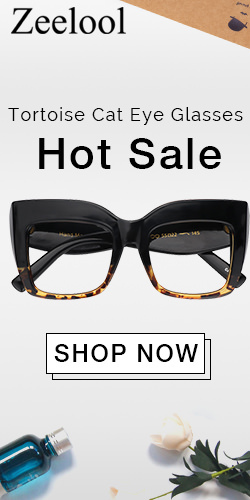 But why wait after you're old and gray? Won't it be super frustrating when you have spent your whole life working and saving alot of money to pay for activities like taking on the highest bungee jump or diving the most beautiful coral reefs, but you can't do it because your doctor or your health condition won’t allow it? 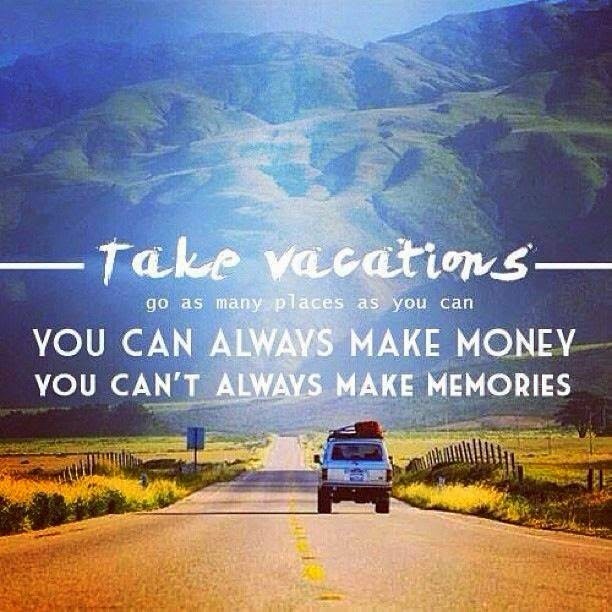 I would love to travel the world, it's one of the reasons why I make it a point to work hard. If only I am qualified to join The Amazing Race I would have done it years ago. But hey, who knows what the future holds and maybe it is one of God's plan for me to see the world and be in awe of His majestic creation. I'm still young and I still have a lot of years to fulfill my Travel Bucket list. But I'm praying I can cross out one major destination yearly or every two years. I’ve been to some of the top beach destinations in the Philippines and I think it’s about time to explore other places instead of going back to the same beaches that I’ve have been too. So Siargao is definitely on top of my travel bucket list. I told myself after going to Siargao, I can now go on and venture out of the Philippines. 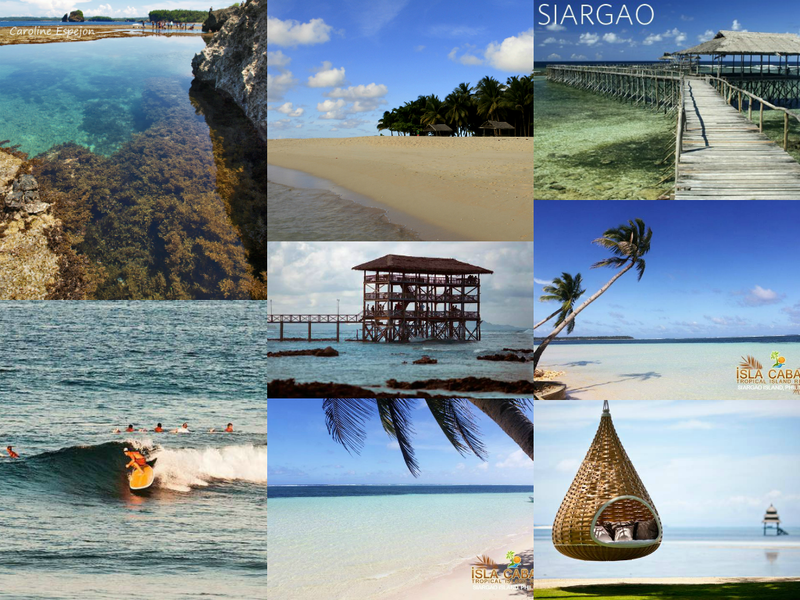 Siargao is an island in the province of Surigao del Norte, Philippines. 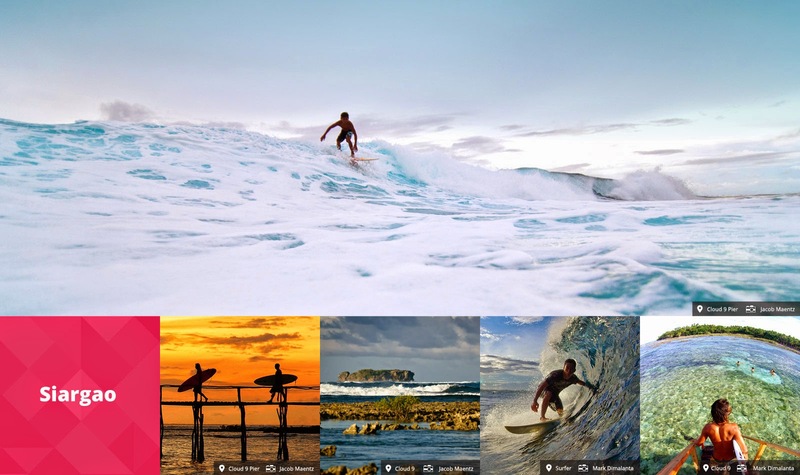 It is a classic tropical island popular among surfers because of Cloud 9’s excellent surfing conditions, especially that it faces the Pacific Ocean. I’ve been wanting to try surfing for some time now, and where else can I best do that but in the waters of Philippines’ Surfing Capital. I was also enchanted by the white sand beaches and sandbars of Siargao especially Guyam and Daku Islets and Naked Sandbar. And most of all, the super clear waters at Magpupungko Rock Formations - limestone and granite sculptures where its pockmarked limestone floor reveals pools of assorted shapes and sizes resembling basins and ponds during low tide. 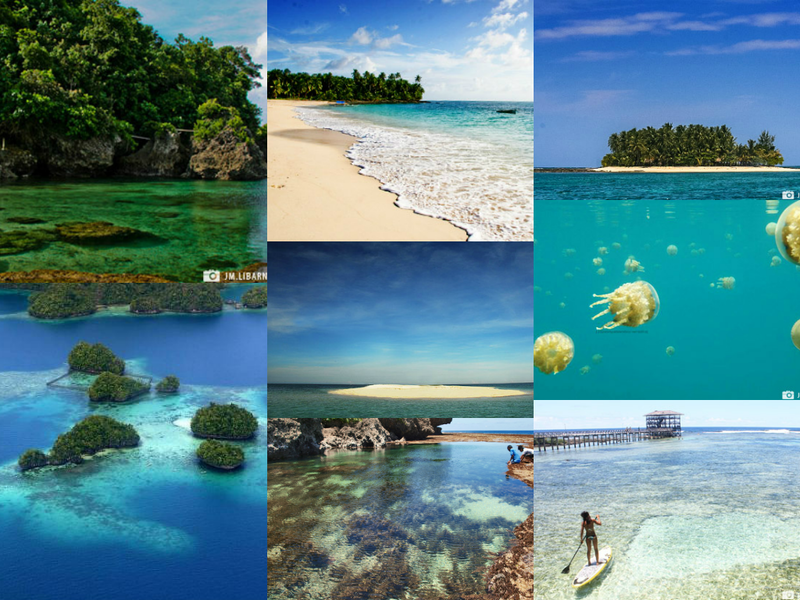 Photos and videos online, made me even drool and really stirred up my desire to see it for myself, so as early as now I’m saving up for it because of one my college friends from the U.S. is asking that Siargao should be our destination when she comes home in January 2015. I promised myself that once I’ve decided to travel outside of my country and have saved enough money, Thailand would be my first destination. 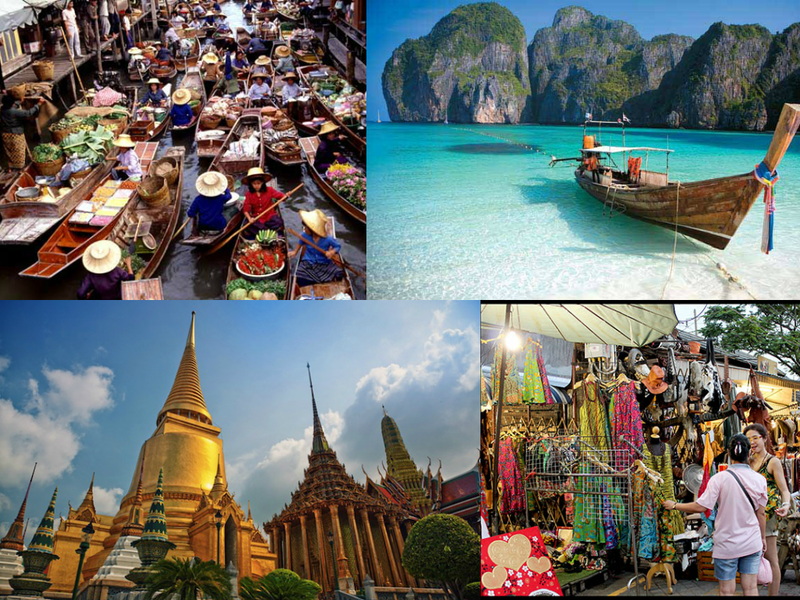 Thailand is one of the most culturally-rich countries in South East Asia and I’ve been meaning to go there for years now, but I am still not able to get that very low airfare promo just yet (yes I’m a stingy when it comes to airline costs). 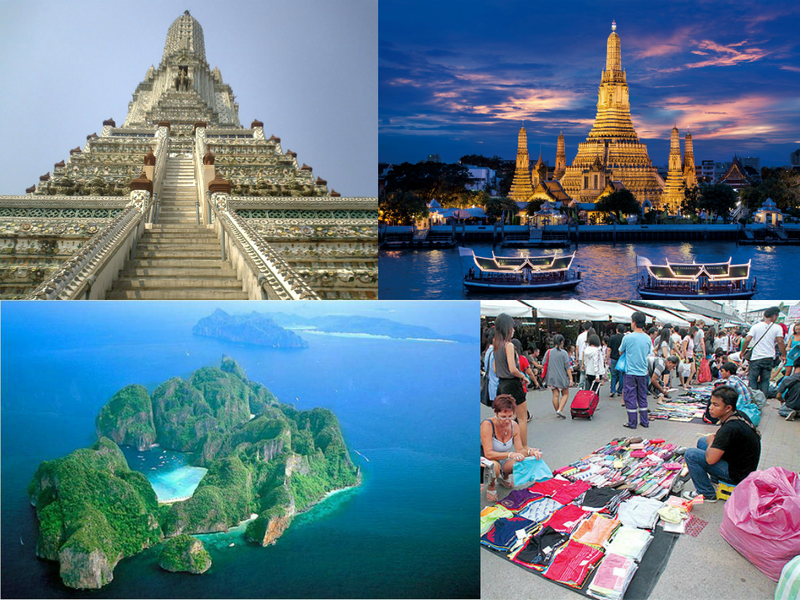 If ever I’ll be able to go to Thailand in the next coming months, two destinations will surely be on my list: Bangkok and Phuket/Krabi. When I think of Bangkok one thing only comes to mind, Shopping! I’ve planned it even before that when I go to Bangkok I will bring just a couple of clothes and then when I go home I’ll make sure my luggage will be fully-packed from what I’ve bought from the Chatuchak Market. And I will definitely pig-out on Pad Thai and Mango with Coconut Sticky Rice! I will not miss it for the world to visit the historic Grand Palace, Wat Arun and Wat Pho temples, ride a cruise along Chao Phraya River and visit the Taling Chan Floating Market. And if time and budget permits, I will also fly to Phuket or Krabi Island to soak myself in the sun, sea and beach. It would also be very nice if I get to swim in the waters of Phi Phi Islands where the Hollywood movie “The Beach” was shot. But I promise that my husband and I will definitely won’t do what Leo DiCaprio and Virginie Ledoyen did, only clean and wholesome fun. LOL! *Sigh*… I just have a thing for super fine white sand beaches and turquoise-colored sea water. Who doesn’t? I know that the Philippines have so many beaches like that, but the first time I saw the beaches at Maldives in a magazine (which my mom brought home, I was in high school at that time), it was like love at first sight. 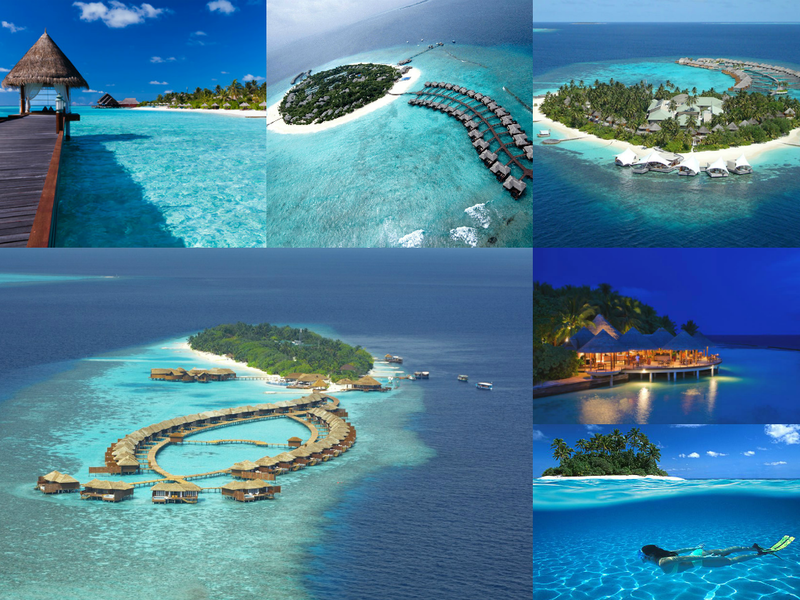 Maldive Islands, is an island nation in the Indian Ocean–Arabian Sea area, consisting of a double chain of twenty-six atolls, oriented north-south. Although staying in a luxurious water villa in one of the resort atolls is very expensive, it wouldn’t hurt to dream right? And maybe, just maybe, I’ll be blessed with an opportunity to set foot in Maldives even for just a night (just like what the author of PinayTravelJunkie.com did). 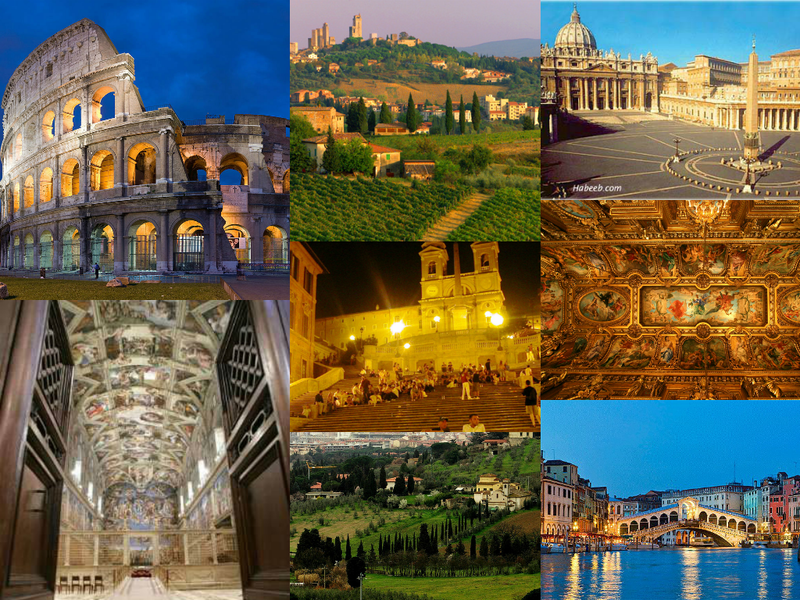 I am also a fan of the Arts and where can I completely immerse myself in all things artsy but in a place where the Renaissance was born- Italy. I’ve been daydreaming the day that I will set foot inside the Sistine Chapel in Vatican and lie down on the aisle while I admire one of Michelangelo’s awe-inspiring masterpieces on the ceiling of the Sistine. 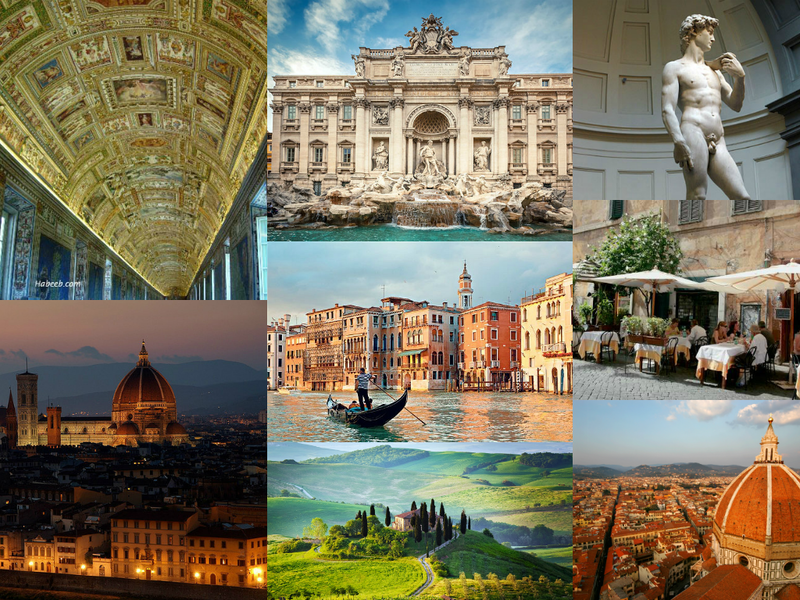 It’s one thing to see the works of great Italian artisans like Brunelleschi, Donatello, Filippo Lippi, Raphael, Botticelli (oh that Birth of Venus! ), Leonardo da Vinci and my favorite Michaengelo in print or photo and it’s one thing to see them in person and face to face. I would probably cry once that dream of mine will come true. And to visit Florence, the birthplace of Renaissance; to eat and drink enjoying Tuscany countryside, ride the Gondolas along the canals of Venice and walk in and around the Colosseum. But most of all, I would want to really know what’s the difference between eating Italian in its most authentic form from those that claim that they are. I will always look forward to that day when I sink my teeth in a pizza slice while I seat in one of the café’s in Rome. I know that there are so many places to see in France but my heart will always beat for Paris. 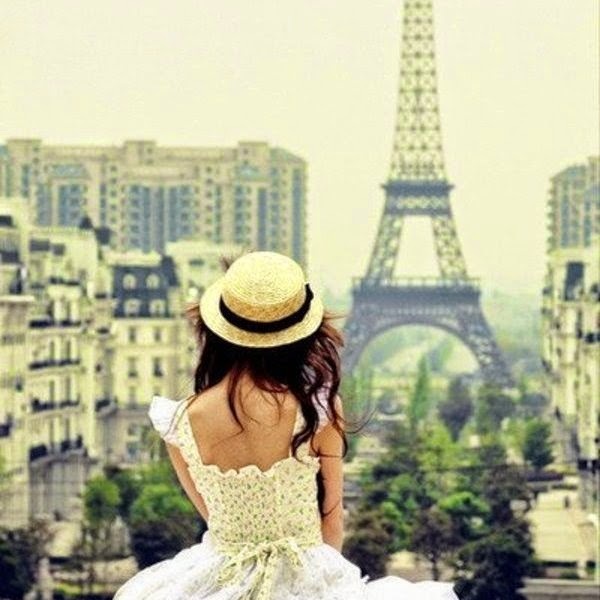 I’m sure it is almost every girl’s dream to see Paris, besides that it’s the most romantic place in the world, it is also the one of the most fashion forward cities in the world. I’ve always been enamored of Paris’ sophisticated charm and like every girl out there, I want a photo of me wherein the beautiful Eiffel Tower stands in the distance. 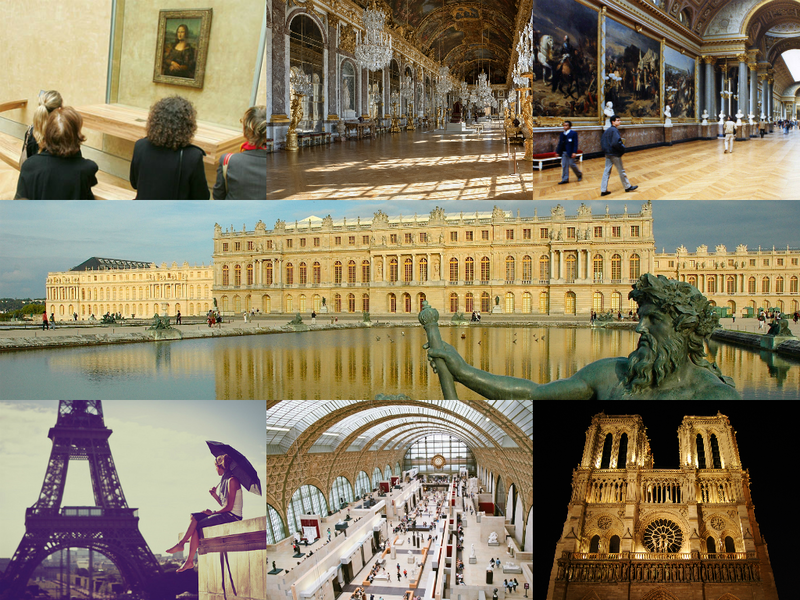 Of course I would also love to see the beautiful works of art housed in the Louvre, the Musée d'Orsay and Paris’ many other museums and galleries. 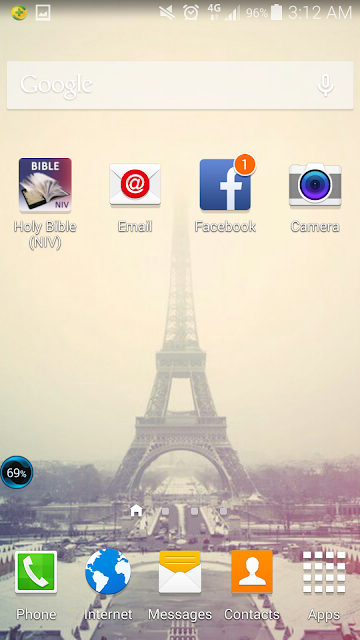 I'm just so in love with Paris that I always put in places where I'll see it constantly. Remember the power of visualization? Where you put your goals and things that you dream to have and it taps your consciousness to motivate you to have it? I'm doing that that's why I have the photo of the Eiffel Tower as my phone's wallpaper and in some of my social media accounts. 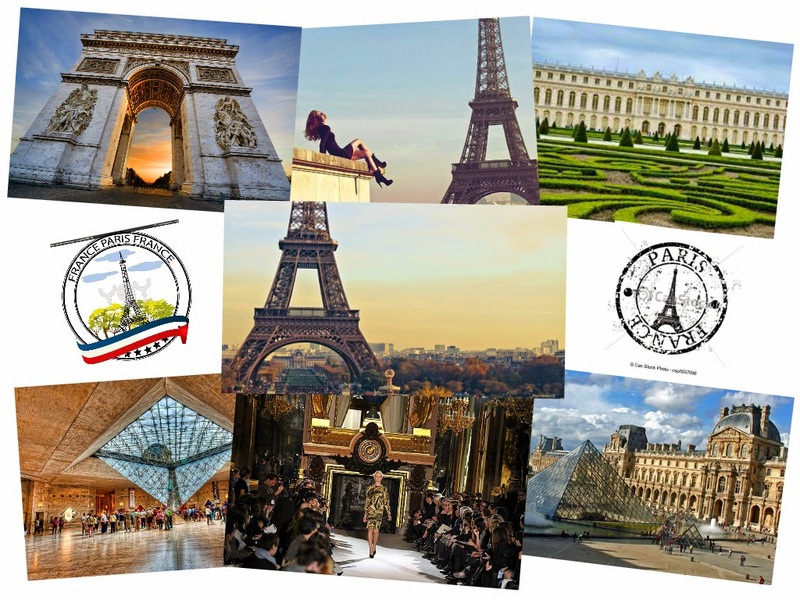 If given the chance, I would also love to see Paris Fashion Week. I think there’s no need for a more elaborate explanation why I want to go to Paris someday. Paris is just is. I also love travelling because more than immersing yourself in another culture, you get to know people. People who teach you something, you and they, not even knowing it. 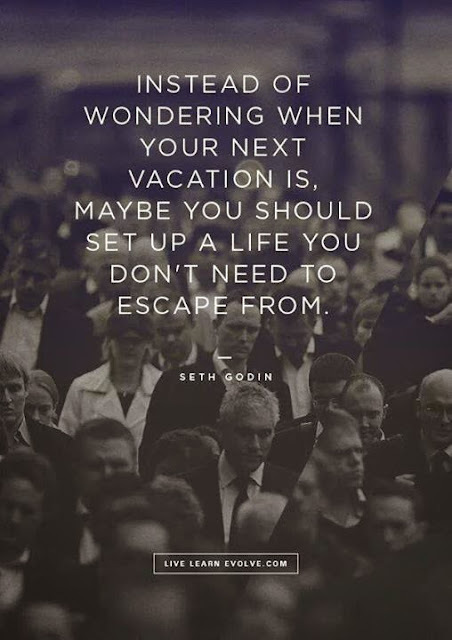 I've had several encounters that after going on a vacation I will realize that, that moment or person I met from that trip taught me a thing or two. 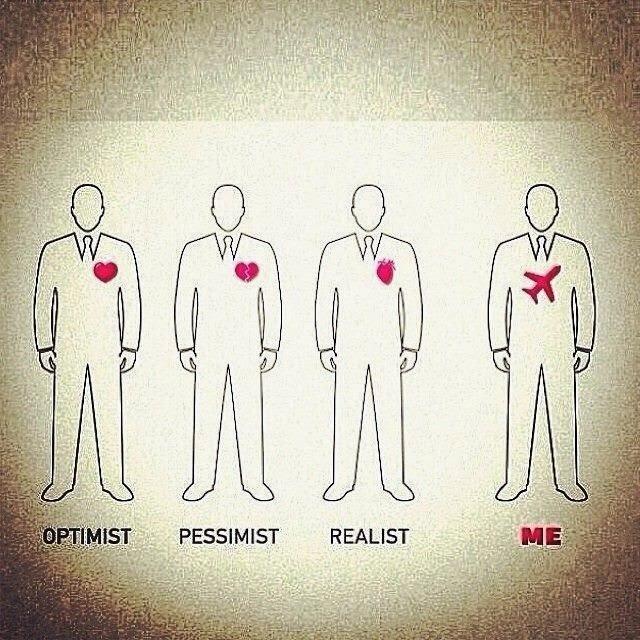 Travelling makes us less prejudice as well. I never want to be prejudice because it's the core of ignorance. For example, we will always have certain beliefs about a group or culture that they're bad people all our lives not knowing if it's really the truth, unless we experience it firsthand. I have used Airbnb.com to organize my travel bucket wish list, #MyAirbnbBucketList, so I have an online list of destinations that I want to keep track of. I’ve known Airbnb.com since 2011 and had used it to look for affordable accommodations when we booked for Hong Kong in 2012 (but we had to cancel it because of unforeseen circumstances). 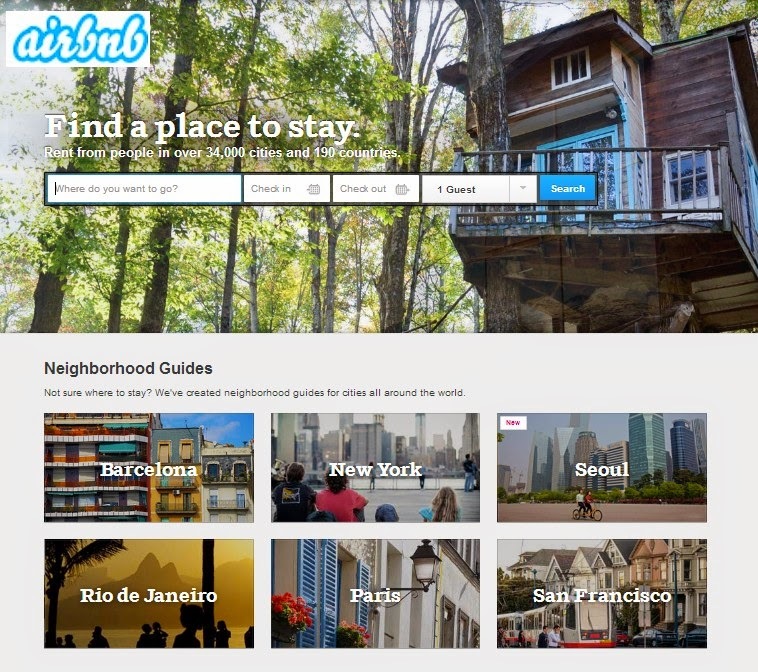 Airbnb.com, though, was founded in August of 2008 and is based in San Francisco, California. Airbnb is a trusted community marketplace for people to list, discover, and book unique accommodations around the world – online or from a mobile phone. Whether an apartment for a night, a castle for a week, or a villa for a month, Airbnb connects people to unique travel experiences, at any price point, in more than 34,000 cities and 192 countries. And with world-class customer service and a growing community of users, Airbnb is the easiest way for people to monetize their extra space and showcase it to an audience of millions. But not until this month that I’m able to fully explore my Airbnb.com account. What I love about AirBnB is that the prices of the accommodations that they offer is very affordable and competitive than if you’re getting hotel rooms. Most of the listings here are extra home spaces by people who live in a certain vacation destination which will most likely make your stay more personal. Besides, if you’re on vacation I don’t think you’ll be spending most of your time inside a hotel room right? You’re most probably going to utilize the room for resting and sleeping in between exploring a vacation spot. So why should you spend bulk of your vacation budget on accommodations when you can get place to stay at a much lower cost and with the same comfortable experience. It has been my practice to list down things that I want to buy, want to do and want to go to, and as I go along I highlight or cross out those that I’ve created. I’ve read from somewhere that doing so (a visualization of your plans) will be inculcated in your consciousness and will in turn help you take actions to achieve them. Since it is the digital age, creating a Travel Bucket Wish List online is much more fun because you get to see photos of your dream destinations. 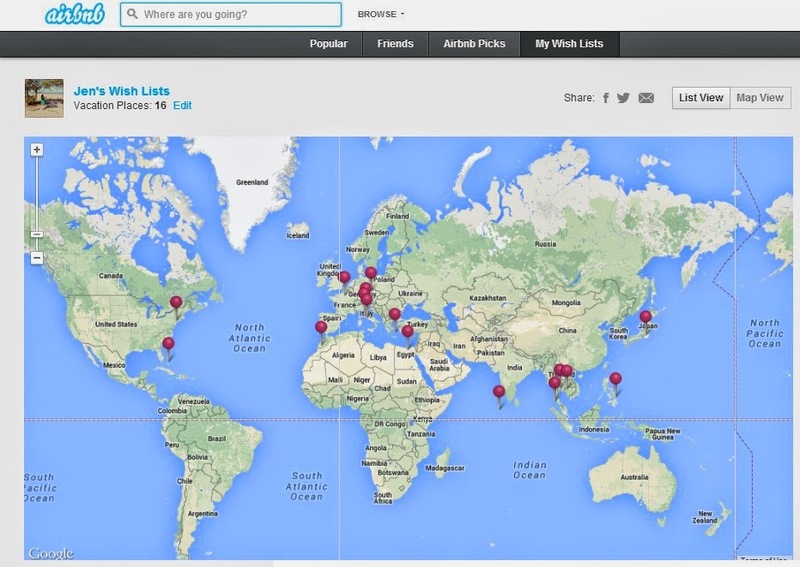 Make Your own Airbnb travel Bucket/Wish List Now! Let me know what you think of my travel bucket wishlist and how about you? What places are you including in yours? p.s. 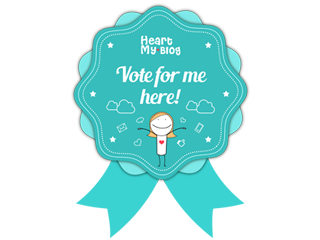 Most of the photos here are taken from the internet, copyright belongs to their respectful owners.